The English Reformation refers to the series of events in sixteenth century England by which the church in England broke away from the authority of the Pope and the Roman Catholic Church. It was part of a wider process, the European Protestant Reformation, a religious and political movement which affected Christianity across the whole of Europe during this period. Many factors contributed to the ferment: the decline of feudalism and the rise of nationalism, the rise of the common law, the invention of the printing press, the transmission of new knowledge and ideas not only amongst scholars but amongst merchants and artisans also; but the story of why and how the different states of Europe adhered to different forms of Protestantism, or remained faithful to Rome or allowed different regions within states to come to different conclusions (as they did) is specific to each state and the causes are not agreed. Different opinions have been advanced as to why England adopted a Reformed faith, unlike France, for instance. Some have advanced the view that there was an inevitability about the triumph of the forces of new knowledge and a new sense of autonomy set over-against superstition and corruption ,; others that it was a matter of chance: Henry VIII died at the wrong time; Mary had no child ; reform did not inevitably mean leaving the Roman Communion ; for others it was about the power of ideas which required only moderate assistance for people to see old certainties as uncertain ; others have written that it was about the power of the state over vibrant, flourishing popular religion ; it was a 'cultural revolution'. Some, on the contrary, have argued that, for most ordinary people there was a continuity across the divide, which was as significant as any changes . The recent revival of scholarly interest may indicate that the argument is not yet over. The English Reformation began as another chapter in the long running dispute with the Papacy over the latter's claimed jurisdiction over the English people, though ostensibly based on Henry VIII's desire for an annulment. It was, at the outset, more of a political than a theological dispute, but the reality of political differences between Rome and England nonetheless allowed growing theological disputes to come to the fore.. The split from Rome made the English monarch head of the English church by " Royal Supremacy", thereby establishing the Church of England, but the structure and theology of that church was a matter of fierce dispute for generations. It led eventually to civil war, from which the emergent church polity at the end was that of an established church and a number of non-conformist churches whose members at first suffered various civil disabilities, which were removed only over time. Catholicism emerged from its underground existence only in the nineteenth century. 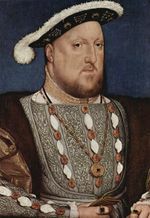 Henry VIII ascended the English throne in 1509 at the age of 17. 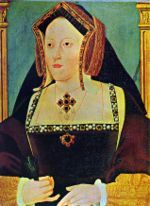 He made a dynastic marriage with Catherine of Aragon, widow of his brother Arthur, in June 1509, just before his coronation on Midsummers Day. Unlike his father, who was secretive and conservative, the young Henry appeared to be the epitome of chivalry and sociability, seeking out the company of young men like himself; an observant Catholic, he heard up to five masses a day (apart from in the hunting season! ); of 'powerful but unoriginal mind', he allowed himself to be influenced by his advisors from whom, neither by night or day, was he alone; he was thus susceptible to whoever had his ear. Between his young contemporaries and the Lord Chancellor, Cardinal Wolsey, there was thus a state of hostility. In 1521 he had defended the Papacy from Martin Luther's accusations of heresy in a book he wrote, probably with considerable help from his Chancellor Thomas More, entitled The Defence of the Seven Sacraments, for which he was awarded the title "Defender of the Faith" ( Fidei Defensor) by Pope Leo X, an act which, in the light of what followed, appears very strange. In 1522, there arrived at court from years in Europe, Anne Boleyn, as maid-of-honour to Queen Catherine, a women of 'charm, style and wit, and will and savagery which make her a match for Henry'. By the late 1520s, Henry wanted to have his marriage to Catherine annulled. She had not produced a male heir who survived into adulthood and Henry wanted a son to secure the Tudor dynasty. Before Henry's father Henry VII ascended the throne, England had been beset by civil warfare over rival claims to the English crown and Henry wanted to avoid a similar uncertainty over the succession. Catherine's only surviving child was Princess Mary. Henry claimed that this lack of a male heir was because his marriage was "blighted in the eyes of God". Catherine had been his late brother's wife, and it was therefore against biblical teachings for Henry to have married her ( Leviticus 20:21); a special dispensation from Pope Julius II had been needed to allow the wedding in the first place. Henry argued that this had been wrong and that his marriage had never been valid. In 1527 Henry asked Pope Clement VII to annul the marriage, but the Pope refused. According to Canon Law the Pope cannot annul a marriage on the basis of a canonical impediment previously dispensed. Clement also feared the wrath of Catherine's nephew, Holy Roman Emperor Charles V, whose troops earlier that year had sacked Rome and briefly taken the Pope prisoner. The combination of his 'scruple of conscience' and his captivation by Anne Boleyn, made his desire to rid himself of his Queen compelling . The death of his chancellor Cardinal Wolsey in November 1530 left him open to the opposing influences of the supporters of the Queen and those who countenanced the abandonment of the Roman allegiance, for whom an annulment was but an opportunity. The Parliament summoned in 1529 to deal with annulment brought together those who wanted reform but who disagreed what form it should take; it became known as the Reformation Parliament. There were Common lawyers who resented the privileges of the clergy to summon laity to their courts; there were those who had been influenced by Lutheran evangelicalism and were hostile to the theology of Rome: Thomas Cromwell was both. There were those, like Foxe and Stokesey, who argued for the Royal Supremacy over the English Church. Henry's Chancellor, Thomas More, successor to Wolsey, also wanted reform: he wanted new laws against heresy. 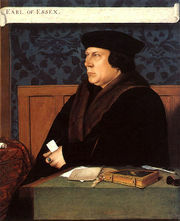 Thomas Cromwell, 1st Earl of Essex (c. 1485–1540), Henry VIII's chief minister 1532–1540. Cromwell was a lawyer and a Member of Parliament,an evangelical who saw how Parliament could be used to advance the Royal Supremacy, which Henry wanted, and to further evangelical beliefs and practices which both he and his friends wanted. One of his closest friends was Thomas Cranmer, soon to be Archbishop. That the laity were also pardoned. 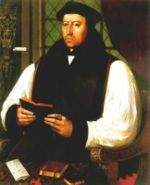 In Parliament, bishop John Fisher was Catherine's and the clergy's champion; he had inserted into the first article, the phrase 'as far as the word of God allows' into the first article. In Convocation , however, Archbishop Warham requested a discussion but was met by a stunned silence from the Convocation; then Warham said: 'He who is silent seems to consent' to which a clergyman present responded: 'Then we are all silent'. The Convocation granted consent to the King's five articles and the payment on 8 March 1531. That same year Parliament passed the Act of Pardon. Thereafter there followed a series of Acts of Parliament. The Act in Conditional Restraint of Annates which proposed that the clergy should pay no more than 5% of their first year's revenue (annates) to Rome proved at first controversial, and required Henry's presence in the House of Lords three times and the browbeating of the Commons. The Act in Restraint of Appeals which was drafted by Cromwell, apart from outlawing appeals to Rome on ecclesiastical matters, declared that 'this realm of England is an Empire, and so hath been accepted in the world, governed by one Supreme Head and King having the dignity and royal estate of the Imperial Crown of the same, unto whom a body politic compact of all sorts and degrees of people divided in terms and by names of Spirituality and Temporalty, be bounden and owe to bear next to God a natural and humble obedience'., thus declaring England an independent country in every respect. Geoffrey Elton has called this Act an "essential ingredient" of the "Tudor revolution" in that it expounded a theory of national sovereignty. The Act in Absolute Restraint of Annates outlawed all annates to Rome, and also ordered that if cathedrals refused the King's nomination for bishop, they would be liable to punishment by praemunire. Finally in 1534 the Act of Supremacy made Henry "supreme head in earth of the Church of England" and disregarded any "usage, custom, foreign laws, foreign authority [or] prescription"..
Thomas Cranmer (1489–1556), Henry VIII's Archbishop of Canterbury and principal author of the first and second Books of Common Prayer. Meanwhile, having taken Anne to France on a pre-nuptual honeymoon, Henry was married to her in Westminster Abbey in January 1533. This was made easier by the death of Archbishop Warham, a stalwart opponent of an annulment, after which Henry appointed Thomas Cranmer as his successor as Archbishop of Canterbury; Cranmer was prepared to grant the annulment of the marriage to Catherine as Henry required. Anne gave birth to a daughter, Princess Elizabeth, three months after the marriage. The Pope responded to the marriage by excommunicating both Henry and Cranmer from the Roman Catholic Church. Consequently in the same year the Act of First Fruits and Tenths transferred the taxes on ecclesiastical income from the Pope to the Crown. The Peter's Pence Act outlawed the annual payment by landowners of one penny to the Pope. This Act also reiterated that England had "no superior under God, but only your Grace" and that Henry's "imperial crown" had been diminished by "the unreasonable and uncharitable usurpations and exactions" of the Pope. In case any of this should be resisted Parliament passed the Treasons Act 1534 which made it high treason punishable by death to deny Royal Supremacy. Finally in 1536 Parliament passed the Act against the Pope's Authority which removed the last part of papal authority still legal; this was Rome's power in England to decide disputes concerning Scripture. This was still not yet a Reformation. That was to come from the dissemination of ideas. The king's councillors, his chief minister, Thomas Cromwell, his archbishop, Thomas Cranmer were part of a loose group of people who had read the works of Martin Luther and had been influenced by them. Theological radicalism had always been around. In England its major manifestation was Lollardy, a movement deriving from the writings of John Wycliffe, the fourteenth century Bible translator, which stressed the primacy of Scripture. But, after the execution of Sir John Oldcastle, leader of the Lollard rebellion of 1415, they never again had access to the levers of power and by the fifteenth century were much reduced in numbers and influence. There were still many Lollards about, especially in London and the Thames Valley, in Essex and Kent, Coventry and Bristol, who would be receptive to the new ideas when they came - who looked for a reform in the lifestyle of the clergy; who held the Word to be the more necessary sacrament, the Eucharist but a memorial - but they were not party to the actions of the government. Other ideas, critical of the papal supremacy were held, not only by Lollards, but by those who wished to assert the supremacy of the secular state as against the church but also by conciliarists such as Thomas More. Other Catholic Reformists, like John Colet, Dean of St. Paul's, warned that heretics were not nearly so great a danger to the faith as the wicked and indolent lives of the clergy. The impact of Luther's thinking was of a different order. The main plank of his thinking, 'justification by faith' alone rather than by good works, threatened the whole basis of the Catholic penitential system with its endowed masses and prayers for the dead as well as its doctrine of purgatory. Neither pious acts, nor prayers nor masses, on this view, can secure the grace of God; only faith. Moreover, printing, which had become widespread at the end of the previous century, meant that vernacular Bibles could be produced in quantity; a further English translation, by William Tyndale was banned but it was impossible to prevent copies from being smuggled and widely read; the Church could no longer effectively dictate its interpretation. A group in Cambridge, which met at the White Horse tavern, and became known as " Little Germany" soon became influential: its members included Robert Barnes and Hugh Latimer, both eventually to be burned as heretics, and Thomas Cranmer, then a cautious and uncommitted student of Luther's ideas. Cranmer was to visit Germany in 1532 and there secretly to marry, but even those who did not encounter German theologians were influenced by them. Cromwell, in particular, was thus able to infiltrate Protestant church reforms into the process of complying with the Royal will. Cromwell's programme, assisted by Anne Boleyn's influence over episcopal appointments,was not merely against the clergy and the power of Rome. He persuaded Henry that safety from political alliances that Rome might attempt to bring together lay in negotiations with the German Lutheran princes. There seemed to be a possibility that Charles V, the Holy Roman Emperor might act to avenge his rejected aunt (Queen Catherine) and enforce the Pope's excommunication. It never came to anything but it brought to England Lutheran ideas: three sacraments, baptism, eucharist and penance, which Henry was prepared to countenance in order to keep open the possibility of an alliance. More noticeable, and objectionable to many, were the Injunctions, first of 1536 and then 1538. The programme began with the abolition of many feastdays, 'the occasion of vice and idleness', which, particularly at harvest time had an immediate effect on village life. The offerings to images were discouraged, as were pilgrimages - these injunctions took place while monasteries were being dissolved - in some places images were burned on the grounds that they were objects of superstitious devotion, candles lit before images were prohibited, English Bibles were to be bought. Thus did the Reformation begin to affect the towns and villages of England and, on the whole, they did not like it . In 1534, Cromwell initiated a Visitation of the Monasteries ostensibly to examine their character, in fact, to value their assets with a view to expropriation. Suppression of monasteries in order to raise funds was not unknown previously. Cromwell had done the same thing on the instructions of Cardinal Wolsey to raise funds for two proposed colleges at Ipswich and Oxford years before. Now the Visitation allowed for an inventory of what the monasteries possessed and the visiting commissioners claimed to have uncovered sexual immorality and financial impropriety amongst the monks and nuns which became the ostensible justification for their suppression. The Church owned between one-fifth and one-third of the land in all England; Cromwell realised that he could bind the gentry and nobility to Royal Supremacy by selling to them the huge amount of Church lands, and that any reversion back to pre-Royal Supremacy would entail upsetting many of the powerful people in the realm. For these various reasons the Dissolution of the Monasteries was begun in 1536 with the smaller houses, those valued at less than £200 a year; the revenue was used by Henry to help build coastal defences (see Device Forts) against expected invasion, and all their land was given to the Crown or sold to the aristocracy. Whereas the royal supremacy had raised few eyebrows, the attack on abbeys and priories affected lay people. Mobs attacked those sent to break up monastic buildings; the suppression commissioners were attacked by local people in a number of places. In the North of England there were a series of uprisings by Catholics against the dissolutions in late 1536 and early 1537. In the autumn of 1536 there was a great muster, reckoned to be up to 40,000 in number, at Horncastle in Lincolnshire which was, with difficulty, dispersed by the nervous gentry. They had attempted without success to negotiate with the king by petition. The Pilgrimage of Grace was a more serious matter. Revolt spread through Yorkshire and the rebels gathered at York. Robert Aske, their leader, negotiated the restoration of sixteen of the twenty six northern monasteries, which had actually been dissolved. However, the promises made to them, by the Duke of Norfolk, were ignored on the king's orders; Norfolk was instructed to put the rebellion down. Forty seven of the Lincolnshire rebels were executed and 132 from the northern pilgrimage . Further rebellions took place in Cornwall in early 1537 and in Walsingham in Norfolk which received like treatment. It took Cromwell four years to complete the process; in 1539 he moved to the dissolution of the larger monasteries which had escaped earlier. Many houses gave up voluntarily, though some sought exemption by payment. When their houses were closed down some monks sought transfer to larger houses; those who were persuaded to leave their orders became, many of them, secular priests. A few, including the Carthusians, refused and were killed to the last man. The abolition of papal authority made way not for orderly change but for dissension and violence; reckless acts of iconoclasm, wanton destruction, disputes within communities which led to violence, and radical challenge to all forms of faith were daily reported to Cromwell, something which he tried to hide from the King . Once Henry knew what was afoot, he acted. Thus at the end of 1538, a proclamation was issued, among other things, forbidding free discussion of the Sacrament and forbidding clerical marriage, on pain of death. Henry personally presided at the trial of John Lambert in November 1538 for denying the real presence; at the same time, he shared in the drafting of a proclamation giving Anabaptists and sacramentaries ten days to get out of the country. In 1539 Parliament passed the Six Articles reaffirming Catholic practices such as transubstantiation, clerical celibacy and the importance of confession to a priest and prescribed penalties if anyone denied them. On June 28, 1540 Cromwell, his long time advisor and loyal servant, was executed. Different reasons were advanced: that Cromwell would not enforce the Act of Six Articles, that he had supported Barnes, Latimer and other heretics, and that he was responsible for Henry's marriage to Anne of Cleves, his fourth wife. Many other arrests under the Act followed. Cranmer, it is said, lay low. By 1546 the conservatives, the Duke of Norfolk, Wriothesly, Gardiner and Tunstall were in the ascendency and were, by the king's will, to be members of the regency council, on his death. 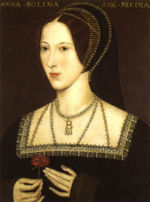 But by the time he died in 1547, Edward Seymour, Earl of Hertford, brother of Jane Seymour, Henry's third wife, (and therefore uncle to the future Edward VI) managed, by a number of alliances with influential Protestants such as Lisle , to gain control over the Privy Council and persuaded Henry to change his will and to replace them by his supporters. 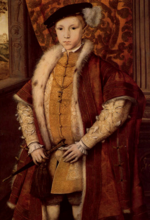 When Henry died in 1547 his nine year old son, Edward VI, inherited the throne. Edward himself was precocious child, who had been brought up as a Protestant, but was of little account politically. The Lord Protector was Edward Seymour, Earl of Hertford who was also Edward's uncle and who proposed to forward Protestant ideas. He was commissionered as virtual regent with near sovereign powers. Hertford, now Duke of Somerset, proceeded at first hesitantly, partly because his powers were not unchallenged. When he acted it was because he saw the political advantage. The 1547 Injunctions against images were a more tightly drawn version of those of 1538 but they were much more fiercely enforced, at first informally, and then, by instruction. All images in churches were to be dismantled; stained glass, shrines, statues were defaced or destroyed; roods and often their lofts and screens were cut down, bells taken down vestments were prohibited and either burned or sold; church plate was to be melted down or sold and the requirement of the clergy to be celibate was lifted. Chantries, means by which the saying of masses for the dead were endowed, were abolished completely, and in 1549 Cranmer introduced a Book of Common Prayer in English. In 1550, stone altars were exchanged for wooden communion tables, a very public break with the past, changing the look and focus of church interiors as it did. Less visible but influential was the new ordinal which provided for Protestant pastors rather than Catholic priests. In 1551, the episcopate was remodelled by the appointment of Protestants to the bench. This removed the obstacle to change which was the refusal of some bishops to enforce the regulations. Henceforth, the Reformation proceeded apace. In 1552 the prayer book, which Bishop Stephen Gardiner had approved from his prison cell, conservative though he was, was replaced by a second much more radical prayer book which altered the shape of the service, so as to remove any sense of sacrifice. Edward's Parliament also repealed his father's Six Articles. The enforcement of these new rules did not take place without a fight. There were rebellions in East Anglia and in Devon and Cornwall over the Prayer Book to which many parishes sent their young men; they were brutally put down. And apart from these more spectacular pieces of resistance, in some places chantry priests continued to say prayers and landowners to pay them to do so; opposition to the removal of images was widespread. (So much so that when during the Commonwealth, William Dowsing (1596-1679) was commissioned to the task of image breaking in Suffolk, his task, as he records it, was enormous.) In Kent and the south east, compliance was most willing and for many, the sale of vestments and plate was an opportunity to make money (but it was also true that in London and Kent Reformation ideas had permeated more deeply into popular thinking). The effect of the resistance was to topple Hertford, now Duke of Somerset, as Lord Protector so that in 1549 it was feared by some that the Reformation would cease. The prayer book was the tipping point. But Lisle, now made Earl of Warwick, was made Lord President of the Privy Council and, ever the opportunist (he was to die a public Catholic), saw the further implementation of the reforming policy as a means of defeating his rivals . Outwardly, the destruction and removals for sale had changed the church forever. In fact, many churches had concealed their vestments and their silver, had buried their stone altars and there were many disputes between the government and parishes over church property. Thus, when Edward died in July 1553 and the Duke of Northumberland attempted to have the Protestant Lady Jane Grey made Queen, the unpopularity of the confiscations gave Mary the opportunity to have herself proclaimed Queen, first in Suffolk, and then in London to the acclamation of the crowds. 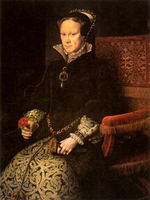 From 1553, under the reign of Henry's Roman Catholic daughter, Mary I, the Reformation legislation was repealed and Mary sought to achieve the reunion with Rome. Her first Act of Parliament was to retroactively validate Henry's marriage to her mother and so legitimise her claim to the throne. Achieving her objective was however, not straightforward. The Pope was only prepared to accept reunion when church property disputes had been settled, which, in practice, meant allowing those who had bought former church property to keep it. 'Only when when English landowners has secured their claims did Julius III's representative arrive in November 1554 to reconcile the realm'. Thus did Cardinal Pole arrive to become Archbishop of Canterbury in Cranmer's place. Mary could have had Cranmer, imprisoned as he was, tried and executed for treason - he had supported the claims of Lady Jane Grey - but she had resolved to have him tried for heresy. His recantations of his Protestantism would have been a major coup for her. Unhappily for her, he unexpectedly withdrew his recantations at the last minute as he was to be burned at the stake, thus ruining her government's propaganda victory. If Mary was to secure England for Catholicism, she needed an heir. On the advice of the Holy Roman Emperor she married his son, Phillip II of Spain; she needed to prevent her Protestant half-sister Elizabeth from inheriting the Crown and thus returning England to Protestantism. There was opposition, and even a rebellion in Kent; even though it was provided that he would never inherit the kingdom if there was no heir, received no estates and had no coronation. He was there to provide an heir. But she never became pregnant; her apparent pregnancy was, in fact, the beginnings of stomach cancer. Ironically, another blow fell. Pope Julius died and his successor, Paul IV declared war on Philip and recalled Pole to Rome to have him tried as a heretic. Mary refused to let him go. The support which she might have expected from a grateful papacy was thus denied her. There was a slow consolidation in Catholic strength in her latter years. The reconciled Catholic, Edmund Bonner, Bishop of London, produced a catechism and a collection of homilies; the printing press was widely put into use in the production of primers and other devotional materials; recruitment to the English clergy began to rise after almost a decade; repairs to churches long neglected were put in hand. In the parishes 'restoration and repair continued, new bells were bought, and churches' ales produced their bucolic profits' . Commissioners visited to ensure that altars were restored, roods rebuilt and vestments and plate purchased. Moreover, Pole was determined to do more than remake the past. His insistence was on scripture, teaching and education and on improving the moral standards of the clergy. It is difficult to determine how far Catholic devotion, with its belief in the saints and in purgatory, had even been broken; certainties, especially those which drew upon men's purses, had been shaken - benefactions to the church did not return significantly; trust in clergy who had been prepared to change their minds and were now willing to leave their new wives - as they were required to do - was bound to have weakened. Few monasteries were reinstated; nor were chantries and gilds in any number. What was needed was time. Thus, such was the mood that Protestants secretly ministering to underground congregations, such as Thomas Bentham, were planning for a long haul, a ministry of survival. Mary's death in December 1558, childless and without her having made provision for a Catholic to succeed her, undid that consolidation. When Mary died childless in 1558 Elizabeth I inherited the throne. She was a Protestant, though an undogmatic one. She thus proceeded slowly (and with some difficulty) in the re-establishment of her half-brother's inheritance. Parliament passed an Act of Supremacy 1559 which validated ten Acts that Mary had repealed and conferred on Elizabeth the title Supreme Governor of the Church of England without difficulty. However, the Act of Uniformity 1559 which forced people to attend Sunday service in an Anglican church, at which a slightly revised version of the 1552 Book of Common Prayer was to be used, was passed by only three votes. The determination to prevent any further restoration was evidenced by the more thoroughgoing destruction of roods, vestments, stone altars, dooms, statues etc., but what succeeded more than anything else was the sheer length of Elizabeth's reign; while Mary had been able to impose her programme for a mere five years, Elizabeth had more than forty. On the other side there were of course, still huge numbers of Catholics, some of whom conformed, bending with the times, hoping that there would be a fresh reverse; vestments were still hidden, golden candlesticks bequeathed, chalices kept. The Mass was still celebrated in some places alongside the new Communion service. It was, of course more difficult than hitherto. Elizabeth's changes were more wholesale than those of her half-brother and all but one of the bishops lost their posts, a hundred fellows of Oxford colleges were deprived; many dignitaries resigned rather than take the oath. Others, both priests and laity, lived a double life, apparently conforming, but avoiding taking the oath of conformity. It was only as time passed that recusancy, refusal to attend Protestant services, became more common. The Jesuits and seminary priests, trained in Douai and Rome to make good the losses of English priests, encouraged this. By the 1570s an underground church was growing fast, as the Church of England became more Protestant and less bearable for Catholics. Catholics were still a sizeable minority. Only one public attempt to restore the old religion took place, the revolt of the northern earls, the Rising of the North in 1569. It was a botched attempt: in spite of tumultuous crowds who greeted them in Durham, the rebellion did not spread, the assistance they sought was not forthcoming, their communication with allies at Court were poor; they came nowhere near to setting free Mary Stuart from her imprisonment in Tutbury, whose presence might have rallied support. The papacy's refusal to countenance occasional attendance at Protestant Services and the excommunication of Elizabeth by Pope Pius V in 1570, presented the choice to Catholics more starkly, and the arrival of the seminary priests, while it was a lifeline to many Catholics, brought further trouble. Elizabeth's ministers took steps to stem the tide: fines for refusal to attend church were raised from 12d. per service to £20 a month, fifty times an artisan's wage; it was now treason to be absolved from schism and reconciled to Rome; the execution of priests began - the first in 1577, four in 1581, eleven in 1582, two in 1583, six in 1584. It became treasonable for a Catholic priest ordained abroad to enter the country. The choice lay between treason and damnation. There is, of course always some distance between legislation and its enforcement. The governmental attacks on recusancy were mostly upon the gentry. Few recusants were actually fined, often at reduced rates; the persecution eased; priests came to recognise that they should not refuse communion to occasional conformists. The persecutions did not extinguish the faith, but they tested it sorely. The huge number of Catholics in East Anglia and the north in the 1560s disappeared into the general population in part because recusant priests largely served the great Catholic houses, who alone could hide them. Without the mass and pastoral care, yeomen, artisans and husbandmen fell into conformism. Catholicism, supported by foreign priests, came to be seen as un-English. By the time of Elizabeth's death there had also emerged a third party, perfectly hostile to Puritans, but not adherent to Rome. It preferred the revised Book of Common Prayer of 1559, from which had been removed some of the matters offensive to Catholics. The recusants had been removed from the centre of the stage. A new dispute was between the Puritans, who wished to see an end of the prayer book and episcopacy and this third party, the considerable body of people who looked kindly on the Elizabethan Settlement, who rejected 'prophesyings', whose spirituality had been nourished by the Prayer Book and who preferred the governance of bishops. It was between these two groups that, after Elizabeth's death in 1603, a new, more savage episode of the Reformation was in the process of gestation. During the reigns of the Stuart kings, James I and Charles I, the battle lines were to become more defined, leading ultimately to the English Civil War, the first on English soil to engulf parts of the civilian population. The war was only partly about religion, but the abolition of prayer book and episcopacy by a Puritan Parliament was an element in the causes of the conflict. As Diarmaid MacCulloch has noted, the legacy of these tumultuous events can be recognised, throughout the Commonwealth (1649-1660) and the Restoration which followed it and beyond. This third party was to become the core of the restored Church of England, but at the price for further division. At the Restoration in 1660 Anglicans, as they came to be called, were to be but part of the religious scene, which was to include various kinds of Non-Conformity, among which would eventually be numbered Roman Catholicism.